Heat oven to 350°F. Grease cookie sheet with shortening or spray with cooking spray. In large bowl, beat brown sugar and butter with electric mixer on medium speed until light and fluffy, or mix with spoon. Stir in remaining ingredients except Root Beer Glaze and additional candies. On cookie sheet, drop dough by rounded teaspoonfuls about 2 inches apart. Bake 8 to 10 minutes or until almost no indentation remains when touched in center and edges are golden brown. Cool 1 minute; remove from cookie sheet to wire rack. Cool completely, about 20 minutes. 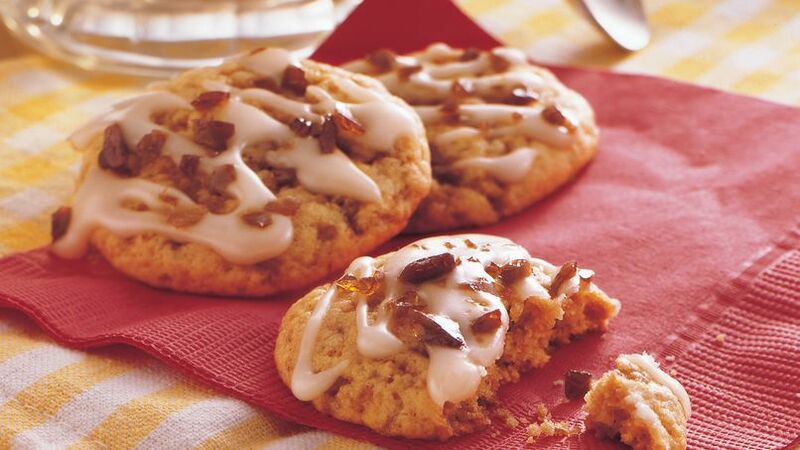 Drizzle Root Beer Glaze over cookies. Sprinkle with additional candies. ROOT BEER GLAZE: In small bowl, mix ingredients with spoon until smooth and then enough to drizzle. With flavors reminiscent of a soda fountain at an old-time drugstore, these cookies will be a hit with kids and adults alike. Favorite beverages of choice with these unique cookies? Milk or root beer to boost the cookie flavor, or hot chocolate or coffee for a new taste sensation.